Recently, my 9-year-old son handed me a birthday invitation for a friend. Of course, the party was three days away and he needed to get a present. And in those next three days, I was booked solid with work, a PTA meeting, and running kids to activities. I am sure you’ve been there! I quickly texted the mom and asked what her boy might like for a gift. She replied, “Nerf guns are always a hit!” I wanted to quickly order something from Amazon. Prime shipping is amazing for moms, isn’t it? I wanted to get a Nerf gun that was fun but not too expensive. I don’t know about you, but I don’t like to spend more than $20 on a kid’s birthday gift. Thankfully, there are some cheap Nerf guns that are plenty of fun. Buying in bulk for office events or family gatherings. Buying with the intention of modifying or painting. There are some great Nerf guns under $20. Here are some of the fun cheap Nerf guns out there! None of these guns require batteries. That does mean that they all require physically pulling back to prime, though. Holds 6 darts at a time. Includes slam-fire for firing all 6 darts quickly. Can shoot up to 75 feet. Can be a little difficult to get the cylinder in and out. Shoots larger mega darts that fly up to 90 feet. Has rotating drum that shoots 6 darts without reloading. Large enough for an adult. Mega darts can cause pain or property damage because of their power. Larger dart size may be incompatible with the rest of your collection. Two triggers, one for saw, one for shooting. Uses regular size Nerf darts. Only shoots one at a time, so could be slow with reloading. Hammer action for easy priming of each shot. Shoots 8 darts before needing reloading. The clear area allows the shooting action to be visible. A bit too bulky for one-handed use. Holds 12 darts at a time. Shoots one at a time. Can be faster than battery-operated guns. Difficult to pull back to prime. This gun is one of the least expensive multi-dart Nerf guns and it gets rave reviews. Check the current price on Amazon. My son has this one and loves it. Easier to load than the Strongarm because you don’t have to flip out the barrel. High velocity for such a tiny gun. Darts are a bit slower than some guns. Fires one dart at a time. Can fire 3 darts before reloading. Compact size is good for smaller hands or for concealing. A bit difficult to pull back. Cheap Nerf Guns: Our Birthday Gift Choice! So, what did we choose for his friend? My son already had the Nerf Elite Disrupter and loved it. He decided to go with the same one for his friend, and it was a hit! 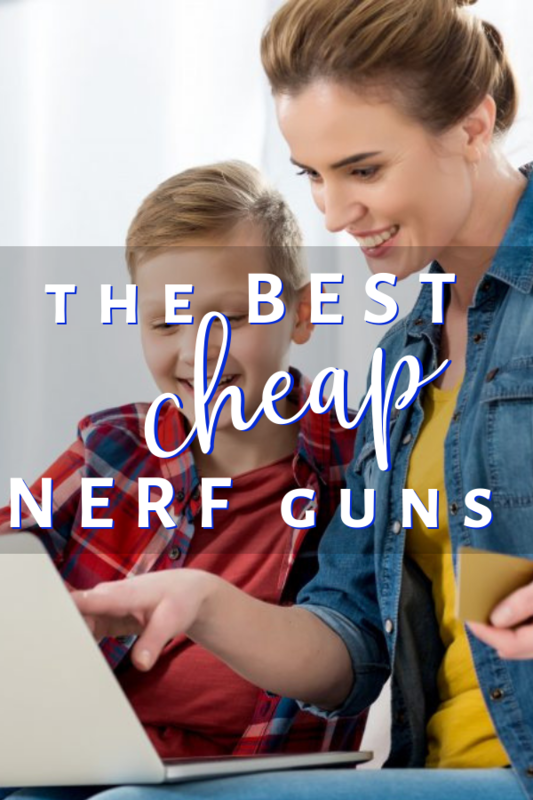 Do you have a favorite cheap Nerf gun? I’d love to hear about it in the comments! The Elite Triad Blaster is my weapon of choice for Nerf battles with my kids ?